Several items to start epic and camouflaged battles in Minecraft. 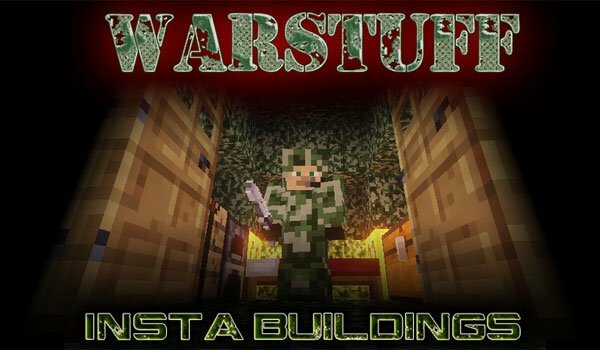 WarStuff 1.7.2 and 1.7.10 is a mod that makes available various elements to enjoy Minecraft battles. So, you can create camouflage tents, bunkers, camouflage suits or armor. We will have three kinds of camouflage, which can be applied on tents bunkers and armor in order to go unnoticed in biomas like the snowy one or like in the jungle, forest or desert. There are two sizes of camouflage tents. You also will find medicine to restore your health quickly, as well as throwing weapons such as grenades, hand bumps and dynamite. How to install WarStuff Mod for Minecraft 1.7.2 and 1.7.10? Double-click to the downloaded file to run Forge installer.